You’ve been busy last week that you forgot to send your special one a gift on Valentine’s Day. But fret not; you can still bring a smile on her face if you send her unique valentines gifts for girlfriend. Better late than never, right? You can send her tickets to the play or concert that she’s been longing to watch; a scuba diving adventure package that you have had reserved months ago. Or if she is fond of drawing or sketching, you can give her a special set of drawing and painting materials, better yet, give her something like this pen and ink drawing. By the way, my daughter drew this beautiful image of legendary actress Audrey Hepburn. 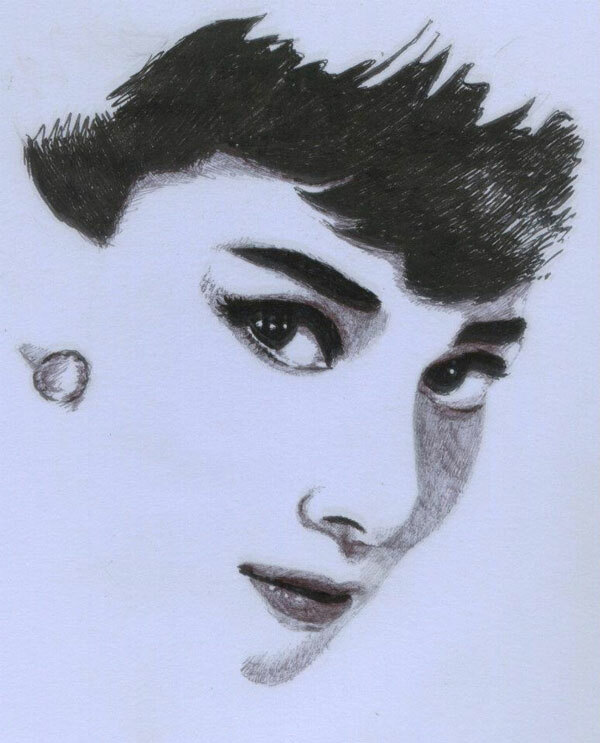 This entry was posted in Artwork, Occasion/Event and tagged Audrey Hepburn, drawing, late valentine gift, pen and ink drawing, sketches, valentine gift on February 25, 2012 by Yami. Your daughter is extremely talented. This is a beautiful sketch of a timeless beauty. I loved Audrey Hepburn. She was from a period in Hollywood that is gone along with that glamor. Hi Bonnie. Thanks so much for the nice words. Not many youngsters knew about Audrey Hepburn, I’m just glad my daughter appreciates the Hollywood icon.